The Hot Peas 'N Butter's show, "Holidays from Around The World", will provide families with an appreciation of the similarities and differences of their global neighbors. With songs in Spanish, French, Hebrew, Ladino, Korean, Portuguese, and of course English, there's something for everyone this holiday season! The group will intermittently discuss the idea that culture may be understood as a collection of symbols, patterns, systems and meanings that are shared by groups of people. For example, inviting you to think about the various countries around the world through their song, "Que Bonita Bandera! ", "What a Beautiful Flag!." Traditions: Hot Peas 'N Butter will take you on a musical trip around the world exploring traditions specific to native peoples. There will be demonstrations of traditional instruments and folkloric dances. For example, through their song, "Que Llueva" and the traditional Zulu chant, "Where is the Rain," Hot Peas 'N Butter teaches children about the similarities between cultures. In this example, both songs convey the importance of rain to both cultures. 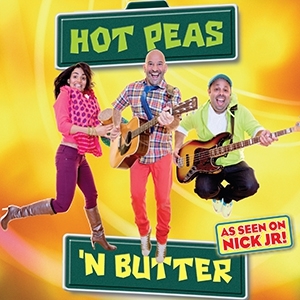 And of course, Hot Peas 'N Butter will sing about being a global family in their original song "Somos Familia", "We're All a Family".